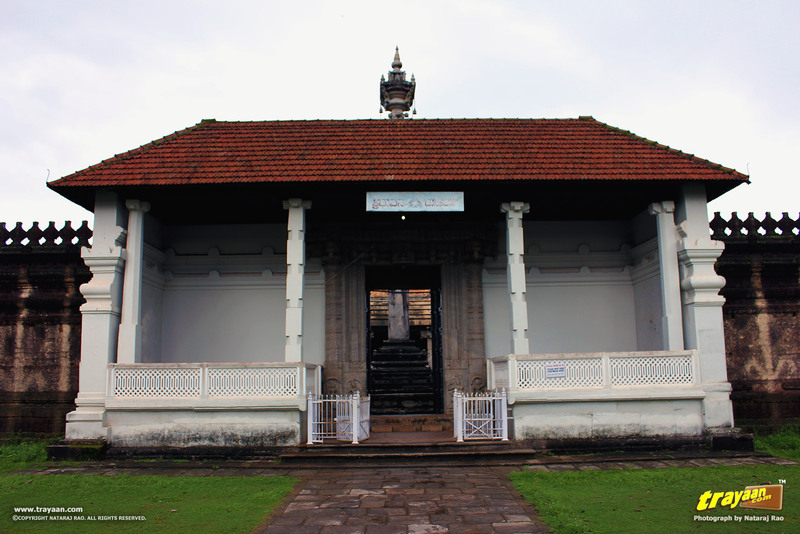 Tribhuvana Tilaka Chudamani basadi, the largest and finest of its kind in coastal Karnataka; which was originally built in 1430 CE, is also considered the most ornate of the Jain temples of this region. It is well known as the Thousand pillared temple (Savira Kambada Basadi) as it has large numbers and varieties of pillars. It is also known as Chandranath basadi since it honours Chandranath, whose eight foot idol is worshipped in the shrine. 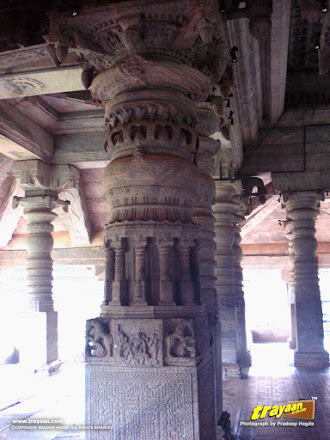 Basadi means a Jain shrine or temple. 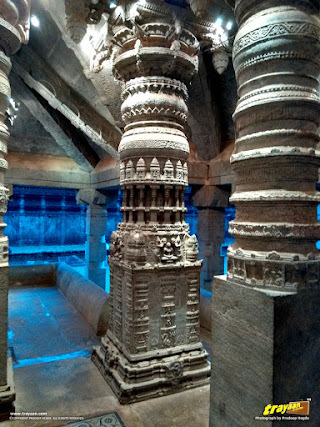 Note : Not to be confused with the thousand pillared temple in Andhra Pradesh! 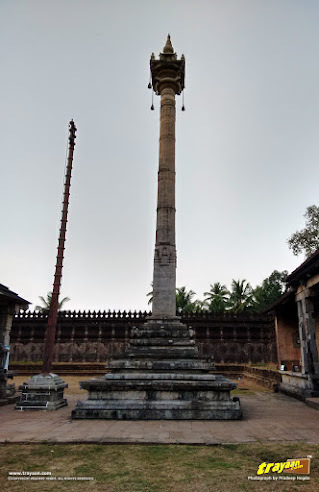 Moodabidri, (Also spelled as Mudabidri, Mudbidri, Moodbidri etc.) ~34 kilometres to the north-east of Mangalore, in Dakshina Kannada (South Canara) district of Karnataka, is a small town in the midst of hills. 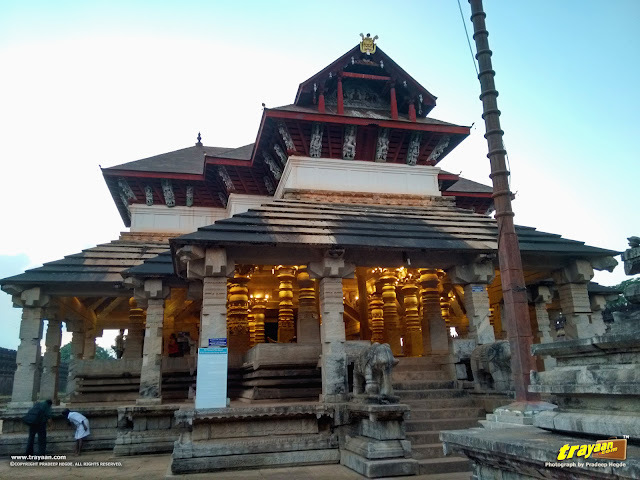 Often referred to as the Jain Kashi of south India, Moodabidri was a center of Jain religion, culture, art and architecture during 14th - 16th centuries with 18 Jain basadis (temples) dedicated to the memory of the Jain Tirthankaras. The Tribhuvana Tilaka Chudamani Basadi (which means, the Crest jewel of the three worlds) is the largest of 18 Jain basadis and considered to be the finest and the most ornate of the Jain temples in coastal Karnataka. 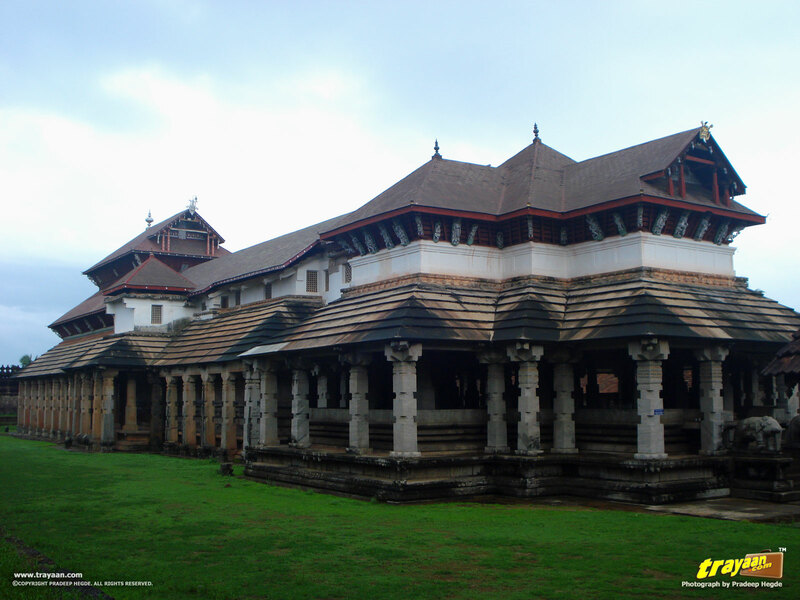 It was originally built in 1430 CE by the Chowta ruler Devaraya Wodeyar, and completed in three stages. . The land to construct the temple was donated by the Vijayanagara king. It took 32 years for its construction and is a charming cluster of seven parts such as, Chaturasa Garbhagriha, Sukhanasi, Theerthankara Mantapa, Gaddige Mantapa,Chitradevi Mantapa, Bhairadevi Mantapa and Manasthambha . This temple is well known as the “Savira Kambada Basadi” (meaning, the thousand pillared temple – in Kannada and other local languages). An 8 feet tall bronze idol of Lord Chandranatha is housed in the sanctum of this temple. We stopped by Moodabidri on our way to Sringeri, along the NH-13 (Renumbered as: NH-169). It is a winding road through quite hilly regions, not very wide (even though it is now a National Highway), with lots of turns and greenery. Leaving our footwear in front of the huge entrance, we entered inside the temple, surrounded by high stone walls on all sides. 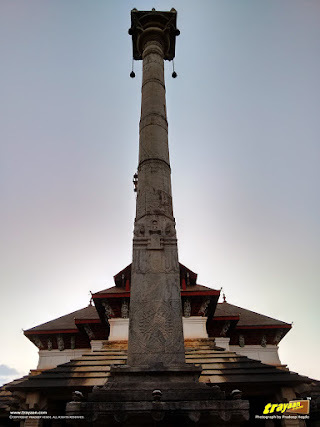 In front of the basadi stood the ~50 feet tall pillar (Manasthambha), which was erected by Chowta Queen Nagala Devi, the queen of Bhairava Raja.. 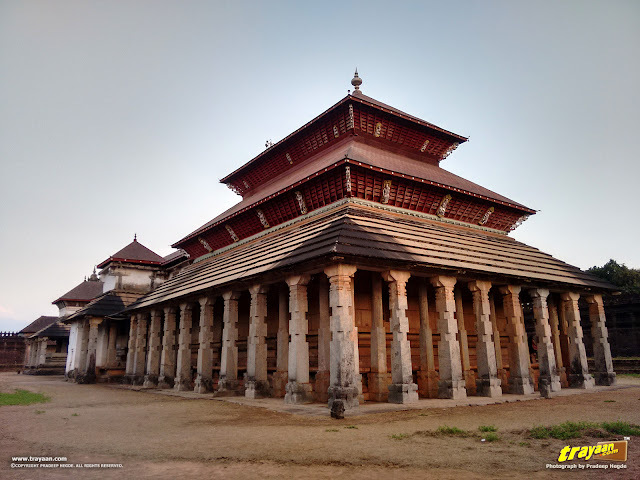 It has a mantapa in the front, called Bhairadevi Mantapa (Mandapa, or a Mantapa is a pillared outdoor hall or pavilion), with beautifully carved and ornate stone pillars and ceiling. 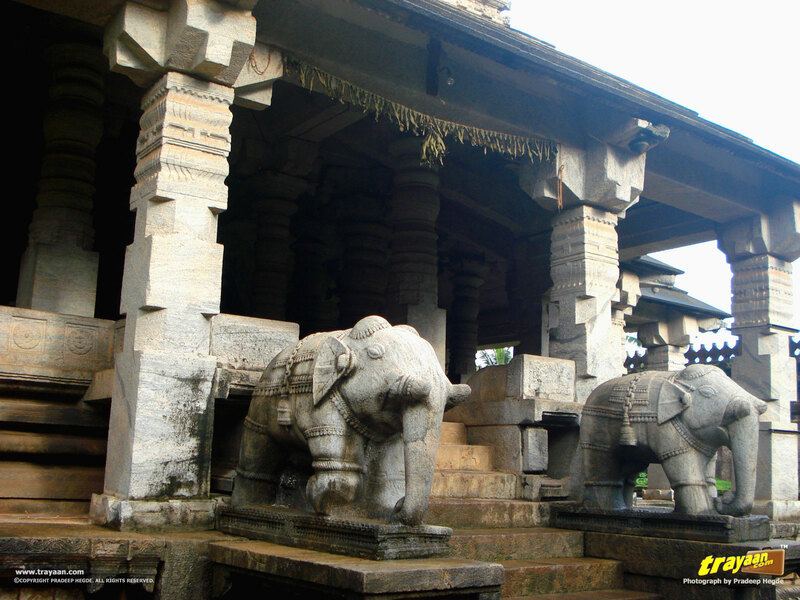 Two finely carved granite elephant balustrades adorn the front steps to this mandapa. Elephant balustrades can be seen in many major Vijayanagara era temples, at the World heritage site Hampi. 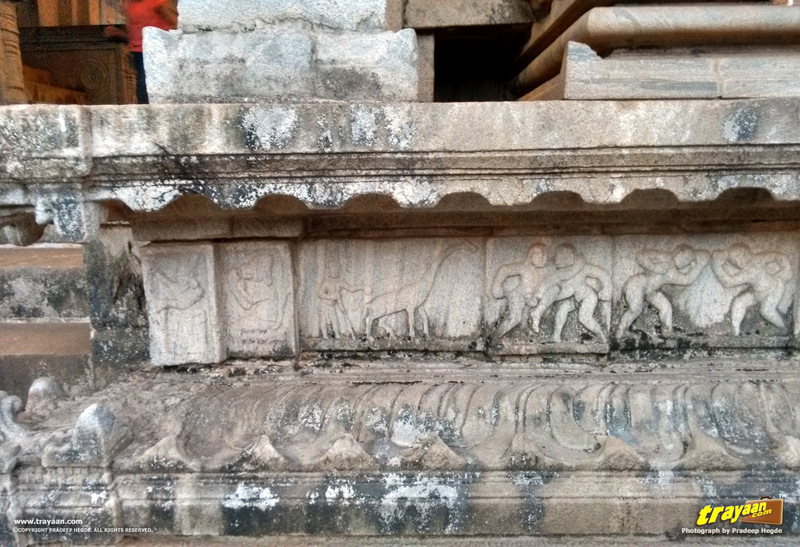 The ones at Hampi are mostly ruined with their trunks cut off. 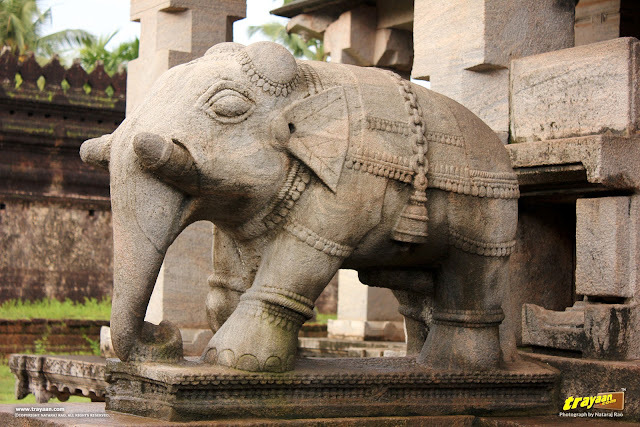 Here, you can see these carved elephants preserved in their full glory. This magnificent open pavilion, the Bhairadevi mandapa was built later as an addition to the temple, in around 1430 CE. A closer view of the elephant balustrade. 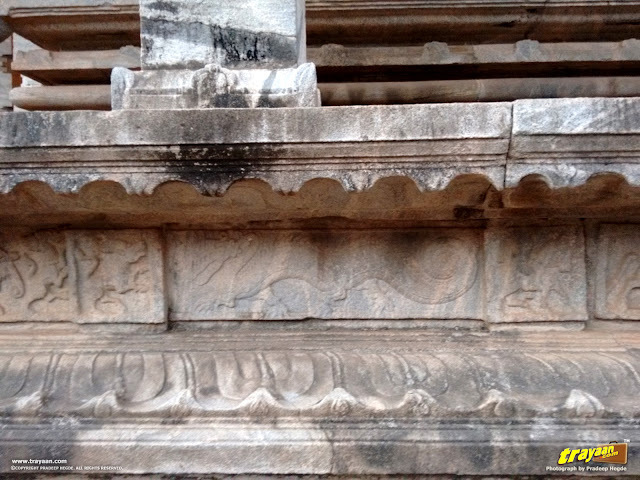 There are carvings of Chinese styled dragons on the outer sides of Bhairadevi Mantapa. Also, there are Giraffe and the Arabian horse. They are foreign influences, as the Jains then had trade relations all over the world. 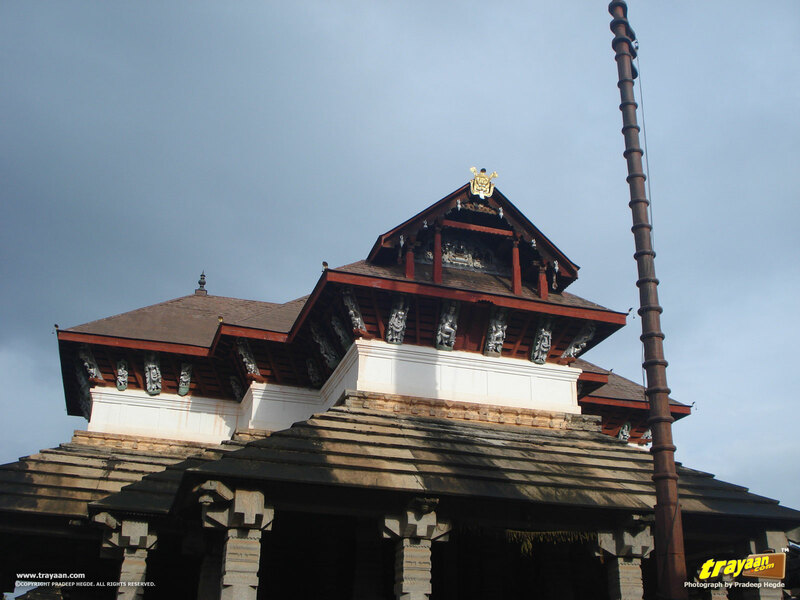 The stone roofing of the ground floor is similar to the slanted stone roofing of Barkur’s Chaulikeri Ganapathy Temple. 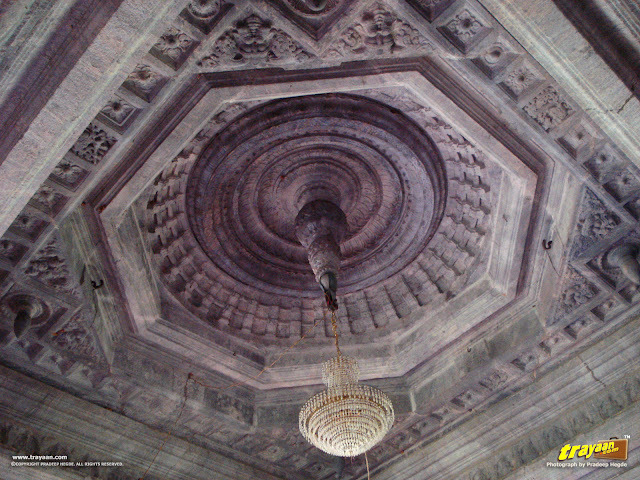 This slanted or tilted stone roofing and shades are commonly found in many old Hindu temples and Jain basadis in the area. 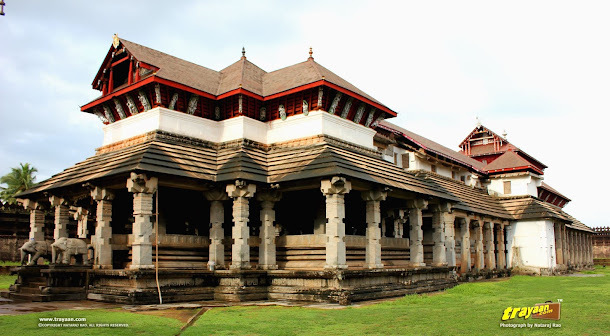 For example, Ananteshwara temple in Udupi, Jain basadis of Karkala, etc. Active worship takes place in this temple even now, and no photography is allowed inside the temple. A person inside the temple did not let us enter inside the inner parts of the temple as we were not Jains! 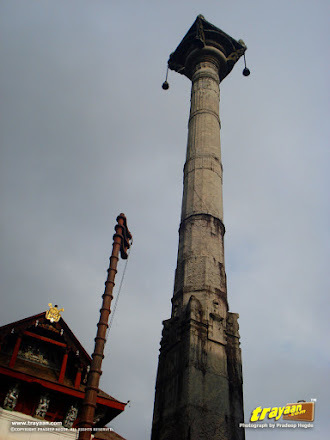 But outside and around the temple, in the front Bhairadevi Mantapa inside the structure, there are no such restrictions. Of course, they have their own religious customs and rules, and we must respect them as good travelers. We were passing by Moodabidri recently, and stopped by to visit this place again. It was around the time of sunset. Now there is an information desk in the front pillared hall, the Bhairadevi mandapa. The complete history and information of the basadi is put up on a board. The caretaker of the information desk showed us the carvings of the Chinese Dragon, the Giraffe. 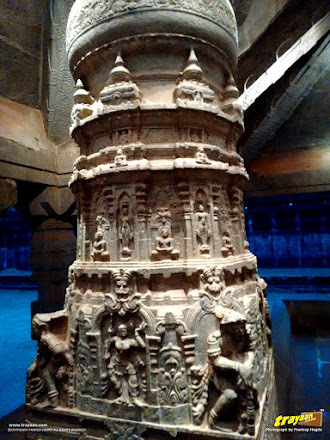 He also showed us scene of Ramayana, with Raama and Seetha, surrounded by several monkeys, which was sculpted on a pillar in the Bhairadevi mandapa, the mandapa you encounter as you enter the basadi. We had mistaken the golden colored relief on the top of the basadi for a dragon earlier. He explained that it was for warding off evil looks. This point is now corrected in the above article. 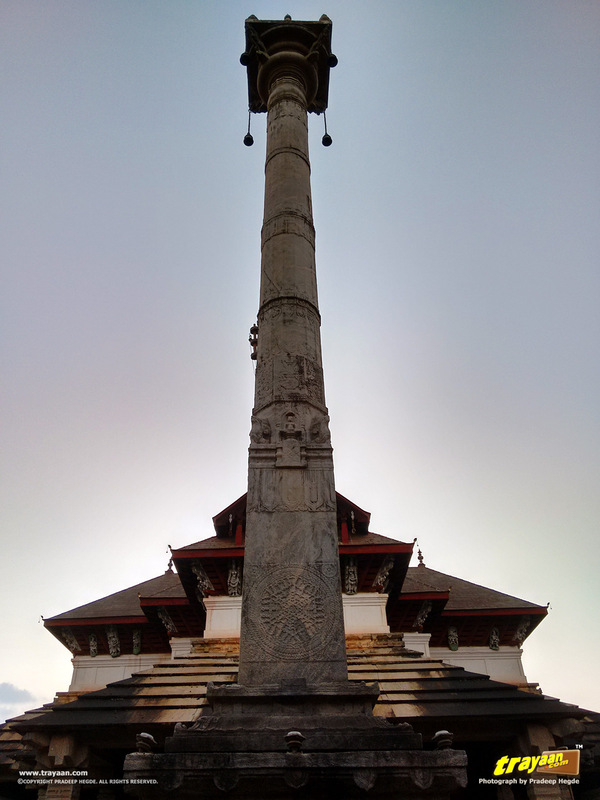 The lights on the mandapa were put on for better viewing around 6:30 PM. 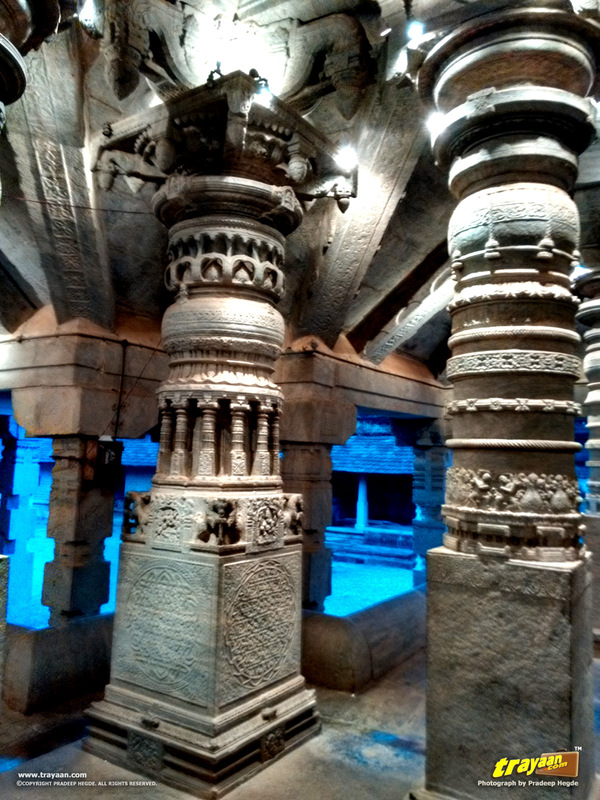 Enthralled by the beautiful and intricately sculpted architecture again, we resumed our journey. Just 35 kilometers away from Mangalore, the nearest Air, Bus, and Rail head and the major coastal city of Karnataka, one can easily visit Moodabidri. If you are going towards Sringeri, Horanadu, or Agumbe; then Moodabidri lies on your way, and the Thousand pillared temple is right beside the main road, inside the town itself. In case you are using public transport, Moodabidri is well connected with Mangalore with several buses. There are no trains that way. As this temple is right within the Moodabidri town, you don’t really need to take an auto or a cab. You can simply take a walk, after alighting from the bus. 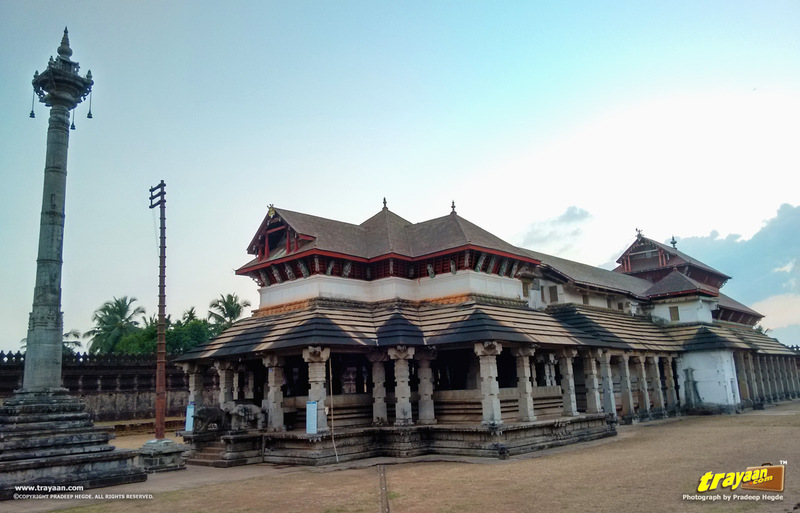 If you are going towards Udupi or Sringeri from there, then you can visit the 42 feet Monolithic Gomateshwara statue and several hundreds of years old Jain temples in Karkala, which lies just 18 kilometers away and comes in the way. There are decent places of food in the town too. Moodabidri recieves a lot of rain in the monsoon season (~ Last weeks of May/Beginning of June, till somwhere in September). It will be very hot and humid in Summer (March till May, until monsoon rains start). See best times to visit below. Guru Basadi: The earliest of the Jain monuments. Here the rare Jain palm leaf manuscripts of 12th century A.D. known as ‘Dhavala texts’ are preserved. Some others are - Kere Basadi, Chola Shetty Basadi, Koti Shetty Basadi, Deramma Shetty Basadi, Ammanavara Basadi. The best time to visit Moodabidri or any other coastal place in India is during the winter. That is, from late September or from October to end of February or early March. As March begins, summer is at the doorsteps, and this place like any other tropical coastline, gets extremely hot and humid. During the rainy days or monsoon weather has its own charm, if you don't mind getting wet. This place receives heavy rainfall during the southwest monsoons.